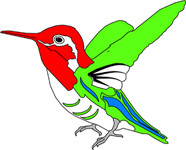 People are always curious about the hummingbird that is part of our logo and they ask us why it’s there. This ministry began when the founder’s second son, Braden, passed away after being born a “special needs” child with many physical challenges in his life. In the part of Amarillo where he and his parents lived, hummingbird sitings seemed to be rare and, in fact, Braden’s father had never seen one. After Braden passed away, not only did Braden’s dad see a hummingbird, one actually struck him on the side of the head in his own front yard and then hovered at arms length chattering and chirping loudly. The bird then flew up and sat on a wire just long enough for Braden to assure his dad that not only was he in heaven, but his physical challenges were no more. We all look upon this messenger as one of God’s gifts. The memory of Braden’s life and his inspiration launched this ministry – the hummingbird is a reminder of him.